Dr. Peters is the Dean L. Morgridge Professor of Geoscience at the University of Wisconsin-Madison. His team’s research questions in the areas of paleontology and sedimentary geology often require aggregating continental- and global-scale geological data into online-accessible databases. 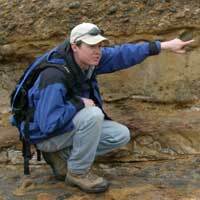 His team has produced the Macrostrat database, the Rockd mobile application and it currently serves as a technical development hub for the Paleobiology Database. Dr. Peters and collaborators in Computer Science have also created the GeoDeepDive EarthCube Building Block, a digital library and machine reading system designed to facilitate the location and extraction of data from the published literature.